The best way to get to know a community is by scheduling a tour. See the facilities, meet the staff and residents, and get a feel first hand what it's like to live at The Barrington of Carmel Assisted Living. Located in Carmel’s flourishing Arts and Design District, The Barrington of Carmel offers the comforts of a resort lifestyle with an emphasis on the “style.” As the Indianapolis area’s premier continuing care retirement community, we provide the perfect environment for those accustomed to getting the very best out of life. Since 2013, The Barrington of Carmel has been more than just a senior living community. We inspire you to live an active and gracious retirement, with a full array of amenities and wellness services. And as Houston’s only Life Care community with four tiers of health care, including skilled nursing care, on one campus. Classic design and traditional touches with a modern flare and grace, rarely found, are to be found all around you. Our library is a stocked with a goldmine of literary treasures and we sport a theater for your entertainment. From the lavish fireplace lounge, adorned with comfortable chairs to the delicate landscaping of our campus grounds, The Barrington of Carmel leaves no stone unturned when it comes to your amenities. Our Executive Chef leaves nothing to chance when it comes to fine dining in the Windemere Dining Room. Meals feature only the freshest vegetables and choicest meats. Rotating menus ensure that every meal is a celebration of taste. Still, those looking for a more casual atmosphere can always unwind in the bistro and café or pub, savoring a pastry or small bite in the company of friends. You are free to focus on what you love most, whether it’s a day with friends or a trip to the symphony, as are there to manage the details of housekeeping and laundry. Our gated community offers 24-hour security, as well as concierge and valet services to attend to your needs. You will find The Barrington of Carmel is not like most communities. 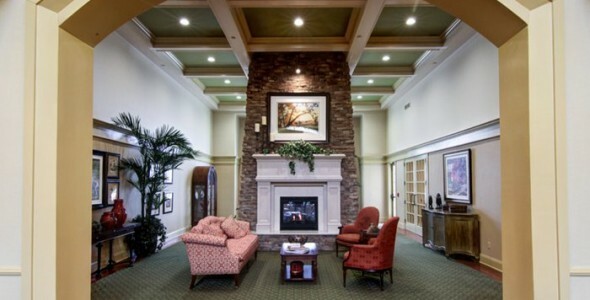 While offering all the comforts and amenities allowing you to enjoy your active retirement, we also provide an unmatched array of health services including assisted living, memory care and both long- and short-term skilled nursing. Because we offer a traditional Life Care contract, you will have comfort and security knowing your needs will be met no matter what, with no uncertainty that costs will skyrocket. Visit us at The Barrington of Carmel, where we invite you to experience tradition, with flair!